Via Baltea is a multifunctional space initiated and run by Sumisura, a cooperative of architects and social workers who operate in the field of urban regeneration and local development. Via Baltea features artisan workshops, a community kitchen and spaces for services for citizens and the neighbourhood. What is Via Baltea and how was it created? 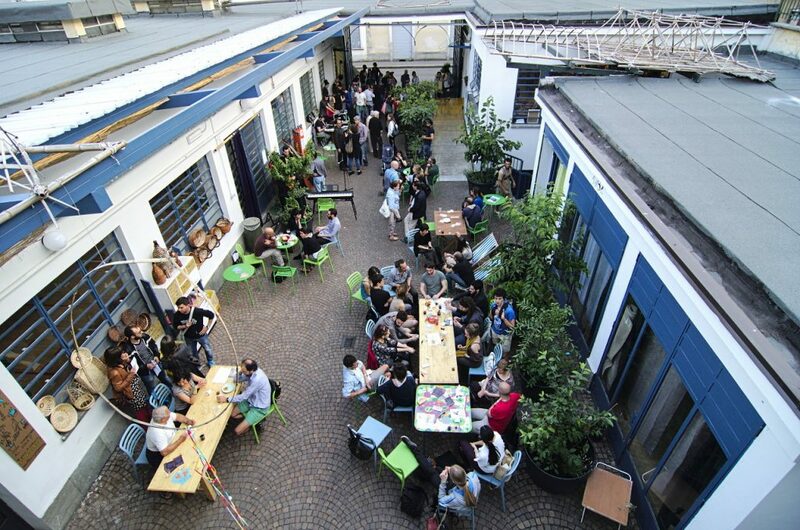 Via Baltea / Laboratori di Barriera is a “neighbourhood workshop”, a hybrid space functioning both as socio-cultural facility and as workspace for craftsmen and artists. The place opened in June 2014 and is managed by “Sumisura (‘made to measure’) – Risorse per l’Ambiente e la Città”, a cooperative born in 2007 that mainly works in the field of urban regeneration and local development. Architects and social workers team enhancing their different skills. In the past, Sumisura has also been active in the renovation of social housing as well as public squares and parks matching physical renewal with provision of social services. Sumisura team was a channel between the residents and the builders involved in the requalification; the team was always present on site, and documented the transformation processes together with the inhabitants. Some of the projects took several years to become reality due to the various bureaucratic processes as well as work phases, and anyhow effects would be visible only in time. A nicer building, green area or square improve the quality of life, but people make the real difference. We focused on creating social and cultural services which can help the renovated squares, gardens and houses to enliven the perception of supporting a community. Via Baltea project aims to provide services and activities to citizens through self-financing coming from commercial activities (the restaurant, the bakery, the rental of spaces, etc.). We aim to be a real social enterprise, but while the concept of social enterprise is straightforward the Italian law does not clearly define what the field of activity of a social enterprise can be, and does not seem to support private initiatives which promote sociability and proximity. 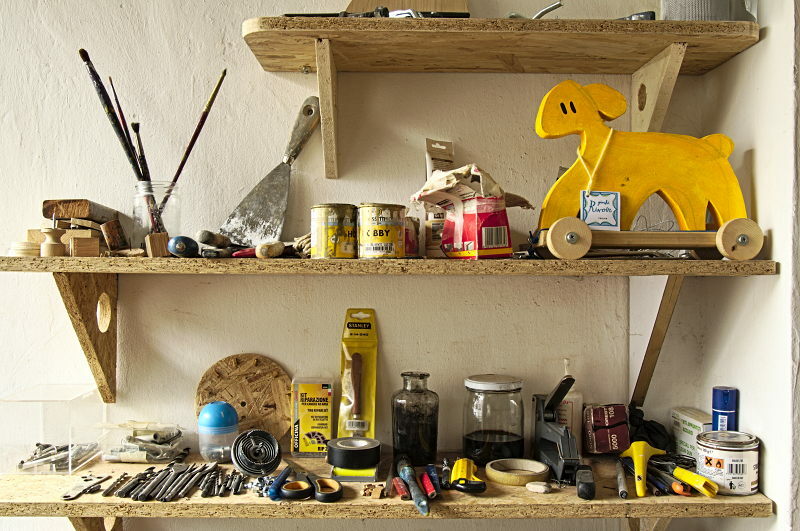 Details of Via Baltea’s carpentry workshop. Photo by Sumisura. How did you further develop this project? The project and its participants grew over time: initially via Baltea was a container that needed to be filled with ideas. Over time contents and participants came, and still we keep on working as “projects activators”, developing initiatives and mixing people we deem can have positive effects on the district. Opening a multifunctional venue in the suburb was a deliberate choice: the aim is to improve the quality of urban life and to build new “cultural centres” outside the city centre. Via Baltea aims to integrate business and manufacturing with social and cultural initiatives. A powerful thread is handicraft, both literally and metaphorically: tangible goods such as furniture and bread are produced, but also consultancy services are ‘hand-made’ in the sense that they are always adapted to the specific needs of those who resort to us. Moreover, via Baltea is a place where recycling, self-repair, and positive relationships are carefully enabled. We chose Barriera di Milano neighbourhood because of the “Urban Barriera” Project by the City of Torino, an urban regeneration program aimed at triggering an overall process involving the historical district of the northern part of Torino. The Urban Project’s easy-term loan policy facilitated renovations in Barriera di Milano, through incentivising commercial activities. We chose this district also because it was in transformation, and year after year we can see how its population is changing. Which other activities did you develop here? The first year, our program was much tinier and the venue itself was less used. Today, besides the café and the bakery, we have two large multifunctional halls which are used for yoga and tango classes, charity events, movie festivals, theatre performances, conferences, business meetings and workshops. Our setting is minimal, and mobile modules allow us to arrange the space features according to the needs. 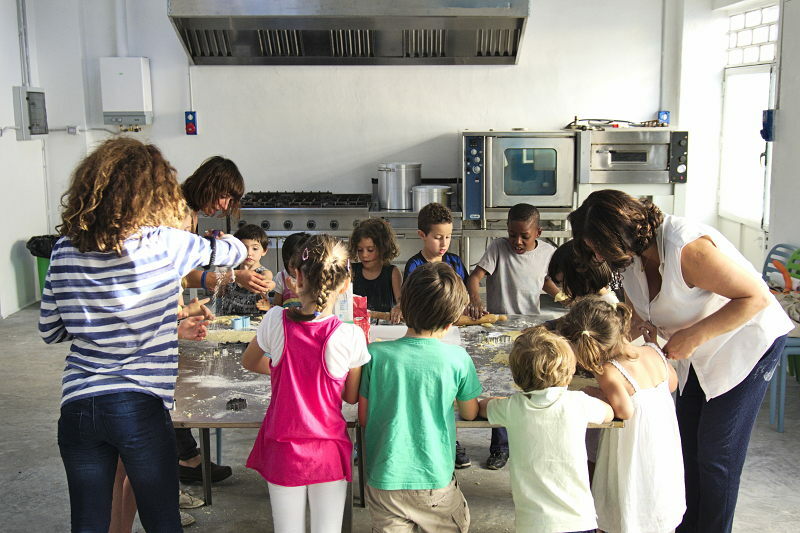 Our kitchen can be rented to host private parties and cooking workshops: it is a “community kitchen” which gives a sense of home and helps us to generate profit to sustain our social activities. Many associations became “resident” here and contributed to enrich our events program, and eventually started working with each other, building common projects. We believe shared informal spaces can be the best trigger for serious conversation, and we often say “from a coffee spoon to the city” – meaning that talking over a coffee we can end up talking about the city we are living in, about housing, work and whatnot. Our café is open, anybody can step in without feeling compelled to place an order. There is also an area called “Bricobar” (repair cafe), run in partnership with two big DIY brands, Bricocenter and Leroy Merlin. It is full of tools people can borrow to repair household appliances, and they can receive experts’ help and learn how to repair or upcycle taking a non-wasteful approach towards objects. We even have a web radio station here, Radio Banda Larga, managed by a group of young people. It has a complete daily show schedule, and they go on air from here, having guests discussing a wide variety of topics. The kitchen during an activity with kids. Photo by Sumisura. How many people work here, and how do you organise your activities? We are a workers’ cooperative with twelve partners, six of whom work part-time in via Baltea. In just three years, we employed five more people, two of whom eventually became members of the cooperative. Since our original work dealt with education and training, we saw a potential in teaching somebody new professional skills. We helped people in need of a job, we integrated foreigners, refugees and chronically unemployed people through work, and we think this was a success. To promote opportunities, projects, cultural and social initiatives, we had to reinvent our jobs. When we came here, two of us started cooking, another one learned to be a bartender and we still perform these activities although they are not part of our professional path. We are in our thirties and forties, and discovered new ways to live and work, seeing things from another perspective. What was here before you accessed the space and how did you modify the venue? It used to be a printing house, established in the middle of the 20th century. Before, it hosted a pasta and rice packaging plant, that moved to a bigger facility. The factory had stayed empty for over five years when we moved in. It is still owned by the printing company from which we are renting. The total surface is about 900 square metres, made up of four buildings arranged around a large courtyard. In these buildings we have created a social café, a community kitchen, a joiner’s workshop, a co-working office, a large hall for activities and courses, a bakery specialised in sourdough products, the Turin Jazz School and a space for theatre rehearsals. 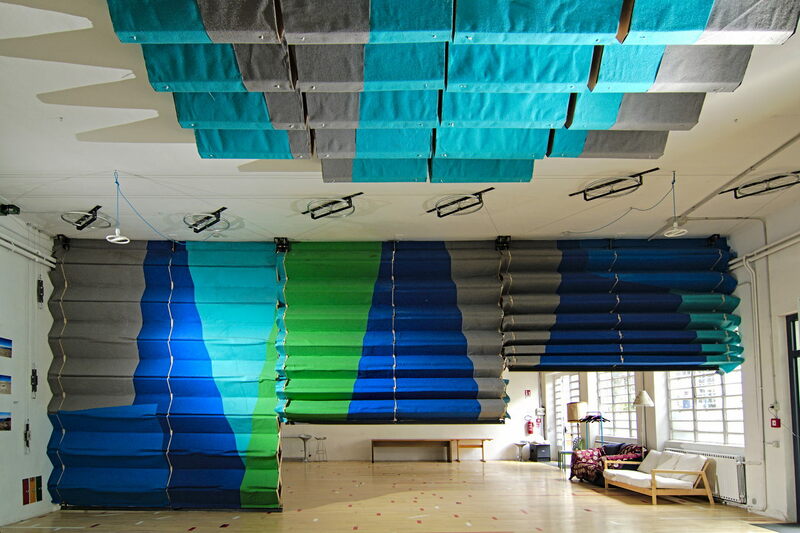 The big hall features a mobile wall, designed by a group of young engineers and architects, that allows us to adapt the size of the hall depending on the needs; it was built using only re-purposed materials, and comprises three separate modules that can be activated thanks to a system of bicycle wheels, cables and pedals. At the first floor are located our office and the co-working area. The latter is a 50 square metres shared area used by external organisations and individuals. Photo of the hall wall. Photo by Sumisura. Our growth has been slow but steady thanks to the welcoming atmosphere, the range of activities offered and the ready usability of the spaces. At the beginning we had no money for furniture, so we built this space step by step. Look at our café! You won’t find two chairs that look the same. Right before the opening we threw a party and asked the neighbours to bring things they didn’t use anymore and out of those things we created the furniture of this place. And we did a lot of renovation work with our hands! The courtyard is full of trees, we have decorative plants here, but we also several fruit trees, and we grow tomatoes and herbs. We deeply value green areas within the city. At the far end of the courtyard you find the joiner’s workshop. Maintenance is one of the most expensive, tiring and time-consuming activities. There is something happening all the time: chairs breaking, floors cracking, a hole in a table, doors creaking, a clogged toilet or even just keeping the walls’ plaster smooth and clean. It is essential to have skilled people on-site who can take care of these issues and who can also help with fixing and maintaining kitchen appliances, because we can’t afford to call technicians, plumbers, blacksmiths or carpenters anytime a problem arises. We are lucky enough to have learnt many things by ourselves, but most of all we are lucky to have Alessandro, our joiner-artist. The deal is that he doesn’t pay a rent for his workshop, but in return he helps with the maintenance. He made, repaired, or upcycled most of the furniture here. Have you ever thought about providing accommodation? Yes, we considered creating a mini-hostel at the first floor, but the building was not suitable neither from the architectural point of view nor from that of the urban planning standards. We think it was important for us to have a more silent area we could use for work, a peaceful corner where it is possible to make a Skype call while not being in the middle of a bar. Did the bakery start from the beginning of your project? Yes, it did. The start was long, as they had a brilliant project but not much experience, so they had to learn how to bake in the same way we had to learn how to run a bar. We all had to learn new things, and it has been a great experience, because we discovered that every new skill we acquired turned into a powerful tool for social interaction. They make all their products with sourdough, and throughout the years they have expanded their production, adding pizza, grissini and pastry to the many different breads they had been preparing right from the start. The quality of their products has improved, and they use flour milled in Stupinigi, at the southern outskirts of the city, and also the wheat is grown in the same area: an extremely short supply chain. This makes their products more sustainable, both from the point of view of the environment and in terms of work ethics, as every step of the production is local and they employ people with special needs or from disadvantaged backgrounds, including refugees. 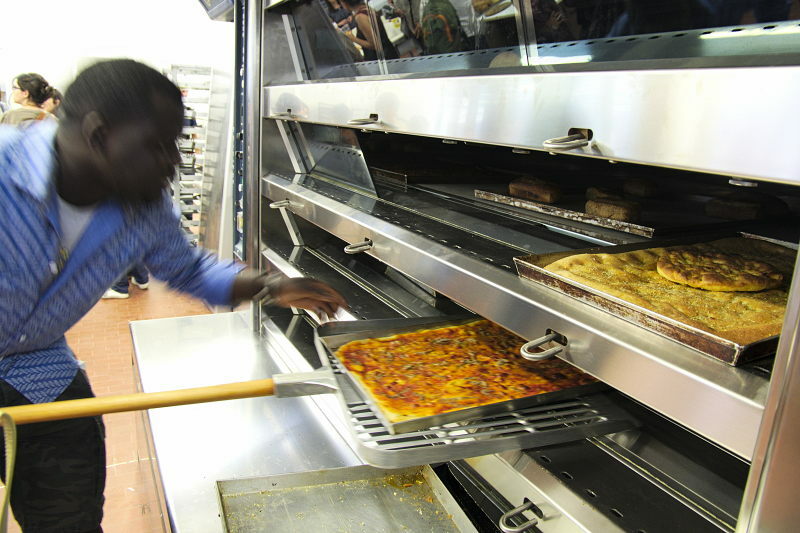 Their work has a huge cultural value as the people who work here at the bakery come from different countries. Bread is present all over the world and comes in very different shapes and tastes, so sharing different production practices makes it more interesting, and in this specific case it makes it healthier and yummier. Worker in the bakery. Photo by Sumisura. What did the local government do, and what do you think local governments should do to incentives initiatives like this? Being a private entity is our biggest challenge, but it allows us to be autonomous. We co-operate with public bodies and as we are a hybrid model, the Municipality is curious in us. For instance, we host an info-point of the City’s Informagiovani service – an information service for the youth dealing with job, volunteering and housing opportunities. Moreover, we function as an “antenna” for both the City and the neighbourhood, similarly to the “Case del Quartiere” (neighbourhood houses), yet our nature is different. To date, we did not receive economic benefits from the local government: neither tax relieves, nor direct subsidies. Probably we are idealists or dreamers, but we can not imagine working if not to improve a little the world in which we live. And for now, to keep it simple, we continue to draw beers to deliver public services. Community, Economy, social inclusion, Turin , cooperative, heritage, neighbourhood, participation, renovation, social enterprise, temporary use.